Nuts and seeds are a high energy dense fuel source, packed with concentrated protein, fatty acids, vitamins, minerals, fiber and other nutrients unique to the specific varieties. 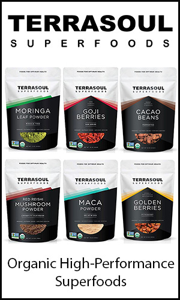 They can be a great addition to a paleo, vegan, raw vegan, vegetarian or ketogenic diet protocols. 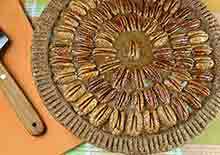 The types of seeds and nuts we are referring to are raw shelled or unshelled assortments that have not been high heat steamed or fumigated with chemicals to "sanitize" them. These are also selections that have not been toasted, dry roasted, blanched or salted, but are minimally processed straight from the tree or plant from which they are derived. If you have ever experienced growing your own nut trees or seed plants, you are well aware of the plentiful amount of food they can provide. Preserved within their own shells and husks, they literally produce pounds and pounds every harvest season, generating an energy sustaining food supply for wild life as well as humans. Although seeds and nuts can be a convenient condensed packet of nourishment for the average person, many people are reluctant to consume them because of their high caloric value. Keep in mind, however, that eating only a small number of nuts and seeds often delivers a sense of fullness that helps to alleviate hunger, often reducing the quantity of meal-time proportions. While minor amounts of raw nuts or seeds eaten occasionally by the handful or as a nut butter is fine once in awhile, when consumed in larger amounts, most nuts and seeds should be soaked, strained and rinsed to eliminate enzyme inhibitors that can impede their proper absorption. 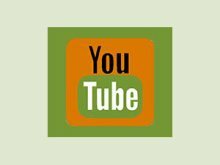 This is a practice typically employed by many health seekers who wish to enjoy a wide range of seed and nut variations in their diet as well as get the most out of their nutritional benefits. We discuss this topic more below in our Phytates, Lectins and Enzyme Inhibitors section. Because seeds and nuts tend to be on the acidic side of the food spectrum, it is always best to try to balance them with other more alkaline food choices, like green leafy vegetables. This is especially the case when consuming them in higher amounts which would be the situation when preparing nut burgers, seed based crackers, seed cheese, nut milks or other vegan recipes. Nuts and seeds are known for their high fat and oil content consisting of mostly monounsaturated and polyunsaturated fats with smaller proportions of saturated fats. This is one of the reasons why it is imperative not to heat them in any way as these oils are volatile to rancidity which turns their good fats into bad ones. 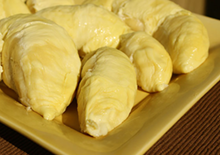 Primarily comprised of fats and proteins, most are relatively low-glycemic, with a small amount of carbohydrate content. Each type of nut or seed comes with its own ratio of fatty acids and other beneficial ingredients, essential amino acids, vitamins and minerals, especially vitamin E, manganese, folate, B6, riboflavin, niacin, selenium, zinc, copper, magnesium, phosphorus and potassium. 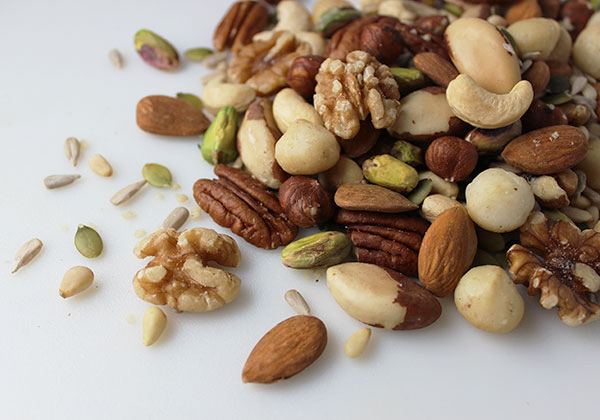 Many nuts and seeds typically contain high amounts of phytosterols compared to other foods and are known to have a cholesterol-lowering influence. This may include the phytosterols: beta-sitosterol, stigmasterol, campesterol, sitostanol, and campestanol. Some seeds, including chia, flax, sacha inchi and hemp seed, are particularly high in the omega-3 fats (alpha-linolenic acid or ALA), but most nuts and other seed varieties are considerably high in omega-6 fatty acids or linoleic acid. 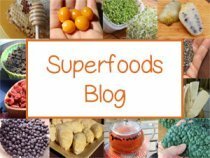 On our omega fatty acids page we discuss the importance of consuming the proper ratios of omega-6 to omega-3 in the diet on a regular basis. The general standard for this is between a 4:1 or 1:1 ratio. This means that for the amount of omega-6 foods you consume, you would need to eat at least 1/4 of that amount in omega-3's. Omega-3's are important because they counteract the pro-inflammatory effects of omega-6 fatty acids. Are Raw Nuts and Seeds Still Considered a Raw Food? Most all nuts and seeds up until 2007 were available as a 100% raw living food complete with healthy fats and phytonutrients. However, since Sept. of 2007 it became required in the U.S. to pasteurize almonds because of previous Salmonella-linked outbreaks initially occurring from commercially distributed almonds sold at Costco. The USDA, together with the FDA, the Almond Board of California and other groups issued a mandatory legislation calling for either steam processing or propylene oxide fumigation treatment to eliminate potential pathogens. According to the Almond Board of California, steaming almonds does not diminish nutritional value. (Source) However, steam pasteurization usually reaches minimum temperatures of up to 200°F (93°C), so this view is widely debatable depending on your health perspective. The second most popular way to treat almonds is to fumigate them with propylene oxide, which is classified as a probable human carcinogen by the U.S. Environmental Protection Agency. Fortunately, PPO is not allowed when the nuts are sold as an organic product, which is one way to ensure they have not been treated. While this mandatory rule, only applies to almonds, and may now include hazelnuts, some large scale manufacturers also started pasteurizing other nut and seed varieties. For this reason, it is important to know where your nuts and seeds come from and how they are treated. 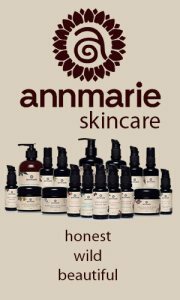 This is not always apparent through labeling as there are no laws requiring companies to indicate employed techniques. Currently (as of 2013) there are a few loopholes in the legislation requirements however. Exemption can be acquired by almond growers who sell directly to the consumer, at a limit of 100lbs/day. This may include small-scale farmers selling almonds at local farmers markets. 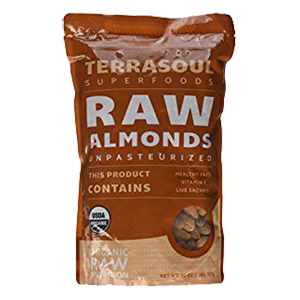 The other way to get truly raw almonds in the U.S. is to import them or buy them from online suppliers who outsource to other countries who do not chemically treat or pasteurize raw nuts and seeds. Be aware than legislator may change in upcoming years, so it is a good idea to do your own research if this is a concern to you. One simple way to test the viability of some of your nuts and seeds is to soak and sprout them to see if they still retain the ability to germinate. This would be a good indication of nutritional quality and potency. 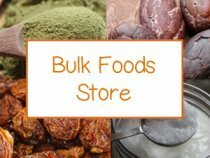 There are some wonderful varieties of raw nuts and seeds to choose from and below we list our favorites along with some of their health benefits and general dietary profile. Brazil nuts are a South American tree and a tall and long living species. They are one of the few trees that still grow wild in their native habitats and in Brazil they are actually illegal to cut down. 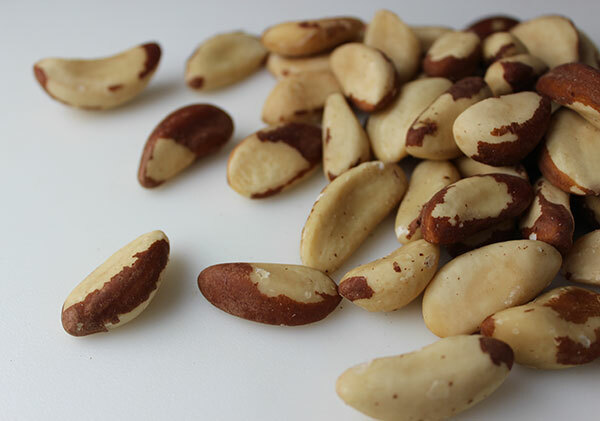 One of the advantages of Brazil nuts is that many nuts sold for export are often wild nuts as opposed to plantation grown. 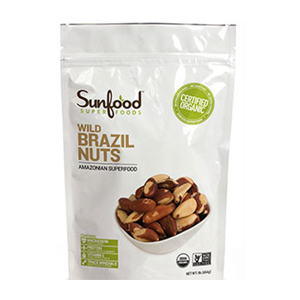 They are an excellent dietary source of selenium, with six Brazil nuts containing 542mcg or 774% the recommended daily allowance for selenium. Adequate amounts of selenium in the diet is important for proper thyroid gland functioning and is a good mineral to supplement when experiencing an under-active or over-active thyroid. Nutritional Info: One ounce (28g) of nuts contain 4g of protein and a total fat content of 18.6g and consists of 4.2g saturated fat, 6.9g monounsaturated fat and 5.8g polyunsaturated fat. They are very high in omega-6 fatty acids, with a lower omega-3 ratio. One ounce of Brazil nuts is 184 calories. Almonds are native to Mediterranean climate regions and are a highly domesticated species that come from a non-edible wild variety, containing a form of cyanide. They are a common plantation grown nut in California as well as many other parts of the world in temperate to hot, dry climate zones. 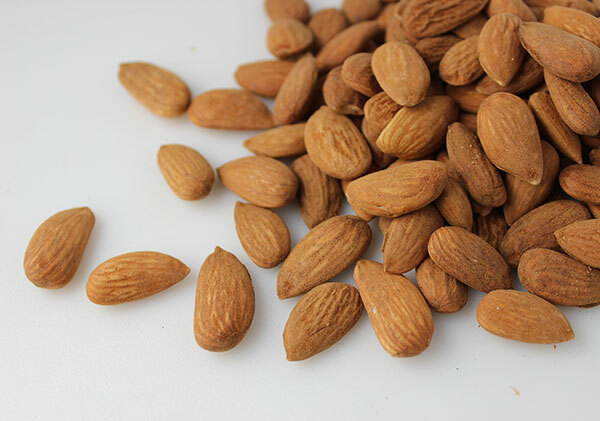 Almonds are one of the most alkaline nuts out of all the nut varieties. They are therefore a popular selection when following a dietary protocol to reestablish appropriate body pH levels or eliminate candida overgrowth. In some research, both almonds and their fibrous skins were also shown to "possess potential prebiotic properties", which may be helpful for encouraging the proliferation of beneficial bacteria in the colon. They are a good source of riboflavin, vitamin E, niacin, manganese, magnesium, copper, phosphorus and one ounce is 7% the daily value for calcium requirements and 8% for iron. Nutritional Info: One ounce (28g) of almonds contains 6g of protein and 14g fat content with 1.1g saturated fat, 8.7g monounsaturated fat and 3.4g polyunsaturated fat. They are also considerably higher in omega-6's compared to omega-3's. One ounce of almonds is 162 calories. Native to Central Asia and the Middle East, pistachio's unique green-purple color is a result of its lutein and anthocyanin content. They have small amounts of xanthophyll carotenoids and vitamin E and are a good source of copper, thiamine and manganese as well as pyridoxine (vitamin B6), important for the production of the neurotransmitter serotonin. According to some research, pistachios have been shown to encourage heart-healthy blood lipid profiles. 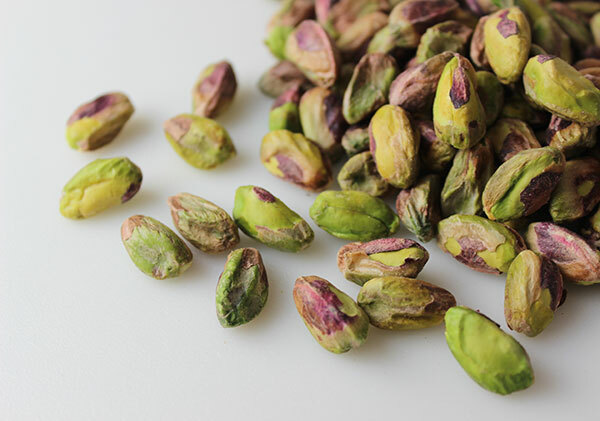 In one study is was demonstrated that "Pistachio consumption significantly decreased triglycerides and thiobarbituric acid-reactive substance levels and significantly increased total antioxidant activity." Nutritional Info: One ounce (28g) of pistachios contains 5.8g of protein, 12.6g of fat with 1.5g saturated fat, 6.6g monounsaturated fat and 3.6g polyunsaturated fat. According to Nutrition Data pistachios have 71.8mg omega-3 vs. 3729mg omega-6, which is actually slightly higher in omega-3's than other nut varieties. One ounce of raw pistachios is 157 calories. 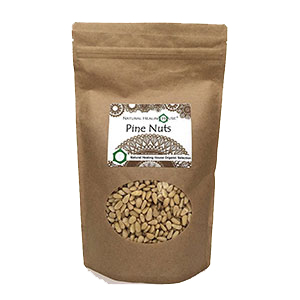 Pine nuts are the edible nuts of different pine tree species. Found in shells within the pine cone itself, the nuts can be cultivated as well as harvested from wild trees. They have long been consumed as a dietary staple in the U.S. by many Native American tribes and their history of use in parts of Europe and Asia dates back thousands of years. 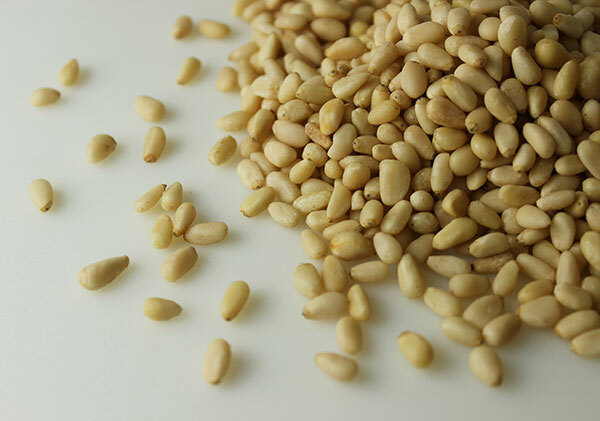 Pine nuts are very high in manganese, an important co-factor for the antioxidant enzyme, superoxide dismutase. They are additionally a good source of vitamin K, vitamin E, zinc, phosphorus, copper and magnesium. The nuts contain pinolenic acid which is identified in some research for its potential "LDL-lowering properties by enhancing hepatic LDL uptake." Nutritional Info: A one ounce (28g) serving contains 3.8g of protein and 19.1g of fat with 1.4g saturated fat, 5.3g monounsaturated fat and 9.5g polyunsaturated fat. High in omega-6's, especially pinolenic acid, with some omega-3 content. One ounce of pine nuts contains 188 calories. The walnut variety most commonly cultivated come from the English walnut tree species that also grow wild, along with black walnut, in many parts of the world where hot dry climates seasonally occur. Compared to other nut and seed selections, walnuts are actually the highest in overall polyunsaturated fats, which make up about 70% of their total fat content. They are likewise especially high in melatonin and folic acid. Nutritional Info: One ounce (28g) of walnuts contains 4.3g of protein and 18.3g of fat with 1,7g saturated fats, 2.5g monounsaturated fats and 13.2g polyunsaturated fats. One ounce of walnuts contains 10666mg omega-6 fatty acids and 2542mg of omega-3 fatty acids, which is close to the ideal 1:4 ratio. 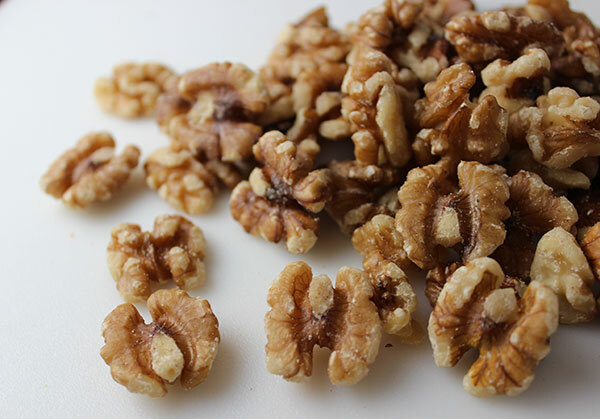 One ounce of walnuts contains 183 calories. Pecans contain significant amounts of manganese which is, as we mentioned, helpful for the production of superoxide dismutase as well as very important for the normal functioning of the brain and proper activity of the nervous system. Along with smaller quantities of copper and magnesium, the nuts are also relatively high in thiamine, additionally important for nerve-related conditions as well as cardiovascular health. The polyphenols in whole raw pecans were demonstrated in some current research to increase antioxidant activities as well as cause a reduction in serum lipid levels in rats fed high fat diets. Nutritional Info: One ounce (28g) of pecans contains 4.3g of protein and 20.2g of fat with 1.7g saturated fats, 11.4g monounsaturated fats and 6.1g polyunsaturated fats. 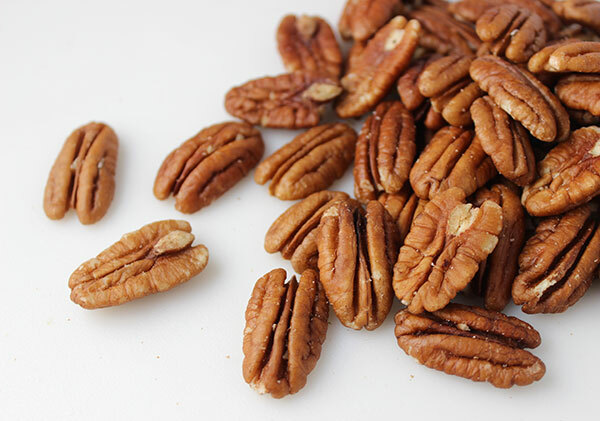 Pecans are high in omega-6's, with about four times less omega-3 fats than walnuts. One ounce of pecans contains 193 calories. 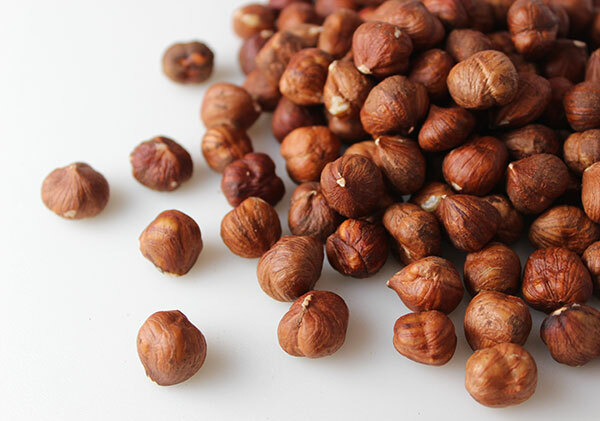 Most hazelnuts, also known as filberts, are commercially produced in Turkey, which makes up about 75% of the world hazelnut production. In a 2013 published study investigating the effects of whole unsalted hazelnut intake on lipid profiles in diabetic individuals, results indicated "that incorporation of hazelnuts into diet can prevent reduction of HDL-C (the good cholesterol) concentrations in patients with type 2 diabetes." Hazelnuts are high in both vitamin E and manganese content, with 20% more manganese than pecans. They are also a source of thiamine, B6, folate, copper and magnesium. 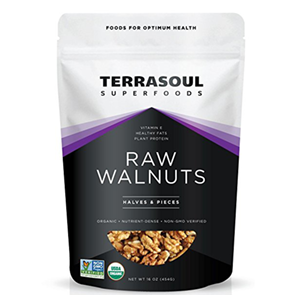 Nutritional Info: One ounce (28g) of hazelnuts contains 4.2g of protein and 17g of fat with 1.3g saturated fats, 12.8g monounsaturated fats and 2.2g polyunsaturated fats. They are considerably higher in omega-6's compared to omega-3's. One ounce of hazelnuts contains 183 calories. Growing on large evergreen trees native to Brazil, cashews are actually classified as a seed rather than a nut species which develop from the end of the cashew fruit. Cashew nuts are a delicious, sweet and creamy nut often used to make raw nut ice creams, raw cheesecake and other raw vegan desserts. They have about 10% starch content which is rare for most nuts and seeds. This provides for their qualities as a thickening agent, but they can often be mucus-forming when over-consumed. Cashew nuts can be purchased in their raw state, but are less common as a "raw" nut type. 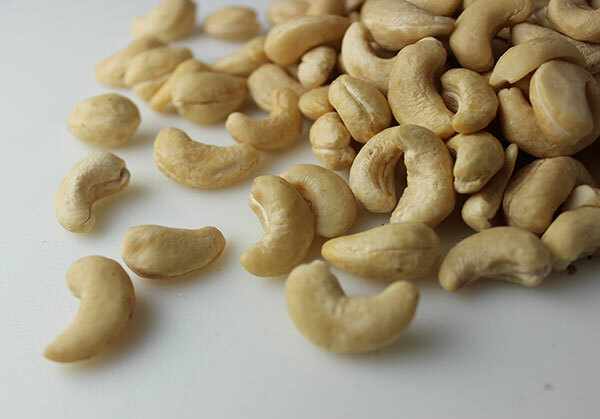 Most cashews found in stores have been heat treated because the shell contains an allergenic phenolic resin and other toxic substances that are easier to remove after the shelled cashews have been roasted in oil or heat treated. 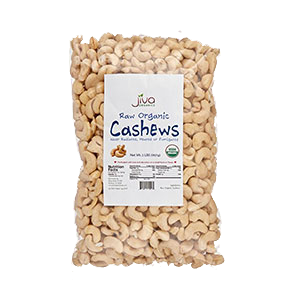 Nutritional Info: One ounce (28g) of cashews contains 5.1g of protein and 12.3g of fat with 2.2g saturated fats, 6.7g monounsaturated fats and 2.2g polyunsaturated fats. High in omega-6 fatty acids with small amounts of omega-3. One ounce of cashews contains 155 calories. The macadamia nut tree is actually indigenous to Australia although many people consider it a Hawaiian delicacy. Containing the highest amount of fat content out of all the nuts and seeds, even pine nuts and walnuts, they are known for their rich fatty texture and sweet flavor. 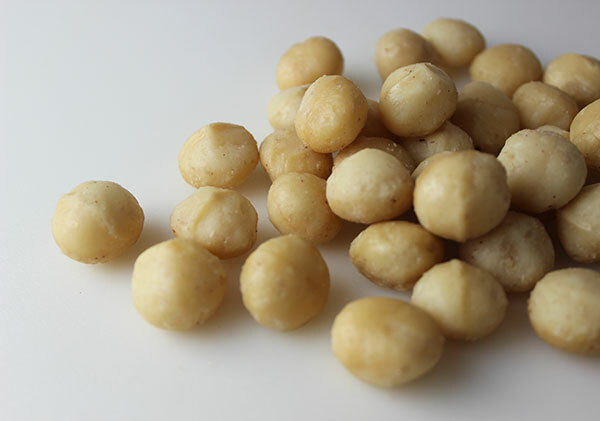 Macadamia has one of the hardest shells known in the nut kingdom and usually requires a special nut cracker to open them, which might explain their relatively high price tag compared to other varieties. Comprised mostly of the monounsaturated fats, oleic acid and omega-7 palmitoleic acid, the nuts have been shown in studies to influence a decrease in total LDL cholesterol and decrease risk of cardiovascular diseases. 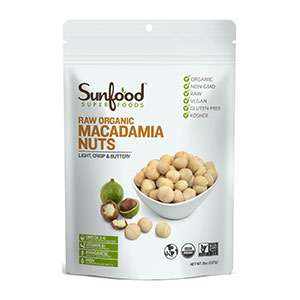 Nutritional Info: One ounce (28g) of macadamia nuts contains 2.2g of protein and 21.2g of fat with 1.3g saturated fats, 16.5g monounsaturated fats and 4g polyunsaturated fats. They are low in omega fats, but the amount they do contain offers a higher proportion of omega-3's at about a 7:1 ratio of omega-6 to omega-3. One ounce of macadamia nuts contains 201 calories. Sunflower seeds are probably one of the most common seed varieties known and consumed around the world. 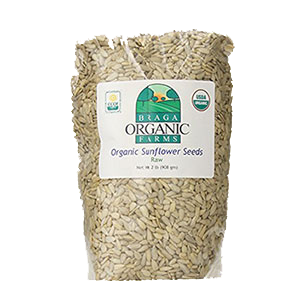 Obtained from the sunflower plant flower, the seeds grow in abundance and are easy to harvest, which explains their less expensive cost per pound compared to other seeds. The top two sunflower seed producing countries, as of 2012, are Russia and China. The seeds are a low-acid type seed and often used in small quantities for those adhering to a dietary protocol for treating candida overgrowth. 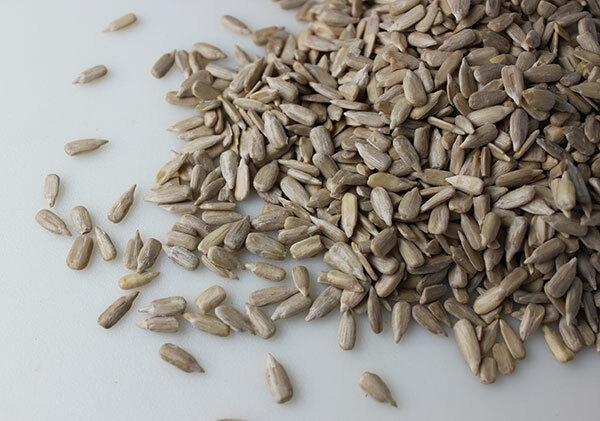 Sunflower seeds are very high in vitamin E with a one ounce serving offering 47% of the daily recommend intake. They are additionally high in folate, thiamine, vitamin B6 as well as the minerals magnesium, copper, manganese and selenium. Moreover, the seeds contain higher amounts of phytosterols compared to other nuts and seeds, which are linked to lowering levels of blood cholesterol. Nutritional Info: One ounce (28g) of unshelled sunflower seeds contains 5.8g of protein and 14.4g of fat with 1.2g saturated fats, 5.2g monounsaturated fats and 6.5g polyunsaturated fats. They are considerably higher in omega-6's compared to omega-3's. One ounce of sunflower seeds contains 164 calories. Pumpkin seeds, also called pepitas, are the green seeds of the pumpkin squash probably most well-known for their reputation as a dietary adjunct for prostate support. This is because the seeds contain greater amounts of zinc compared to most other nuts and seeds, aside from hemp seeds. The prostate gland is known to comprise the highest concentrations of zinc of all the soft tissues. Zinc is viewed as a beneficial mineral supplement for reducing risk of prostate carcinoma, which has been associated with reduced zinc levels in the body, according to a 2011 study review. Pumpkin seeds are a good source of vitamin K with some riboflavin and also contain the minerals iron, magnesium, manganese, copper, phosphorus as well as zinc. 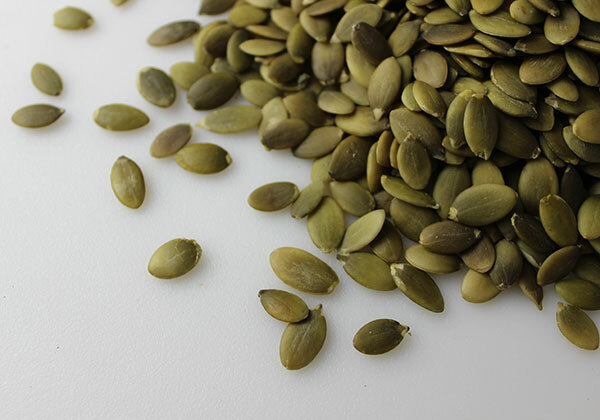 Nutritional Info: One ounce (28g) of shelled pumpkin seeds contains 6.9g of protein and 12.8g of fat with 2.4g saturated fats, 4.0g monounsaturated fats and 5.9g polyunsaturated fats. They are considerably higher in omega-6's compared to omega-3's. One ounce of pumpkin seeds contains 151 calories. Hemp seeds come from the hemp plant, which contain more fiber and seeds than its THC potent cousin. The popular phrase about hemp seeds is that "you can't get high on the seeds, you only get healthy." The seeds not only contain a good amount of protein, but are naturally abundant in higher quality globulin proteins known as edestin and albumin, which are easily converted to amino acids in the digestive tract. The seeds can often be consumed raw without the need for soaking as they are highly digestible by most people. Hemp seeds are commonly well-known for their higher amount of essential fatty acids compared to other nuts and seeds, offering a more balanced 4:1 ratio of omega-6 to omega-3. The seeds are good sources of vitamin E and also contain substantial amounts of magnesium, calcium, iron, sulfur and zinc. 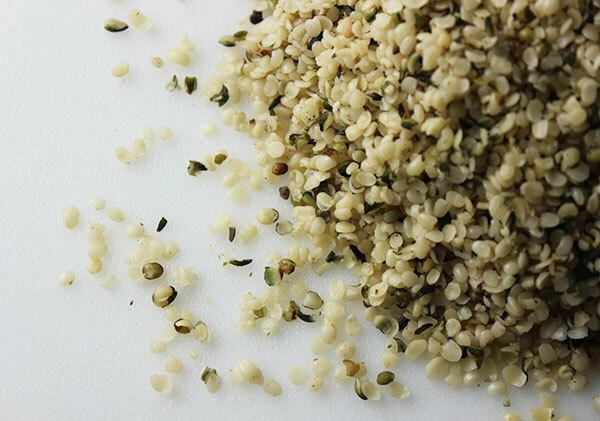 Nutritional Info: One ounce (28g) of shelled hemp seed contains 10.5g of protein and 12.6g of fat with 0.9g saturated fats, 1.7g monounsaturated fats and 9g polyunsaturated fats. 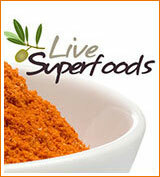 The seeds are good sources of omega-3 essential fatty acids, yielding about 7g of omega-6 to every 2g of omega-3's. One ounce of hemp seeds contains 162 calories. Chia seeds are similar to flaxseed in their ability to absorb water and form a gelatinous consistency when soaked for a short period of time. 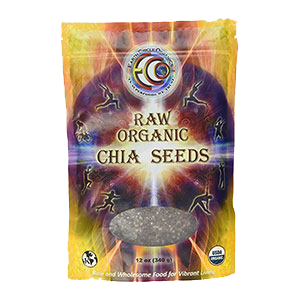 Chia seed is an excellent source of essential omega-3 fatty acids, containing over 3 times the proportion to omega-6, which is extremely rare for most seed types, aside from flax. The seeds when soaked and blended add a thick quality to shakes and porridge as well as desserts, like puddings and pies. They are very high in fiber content and provide a hydrating quality that is soothing to the digestive tract, encouraging regular bowel movements. Consuming chia blended into drinks and smoothies is additionally a nourishing superfood that time releases nutrients and delivers an energizing, long burning fuel source. 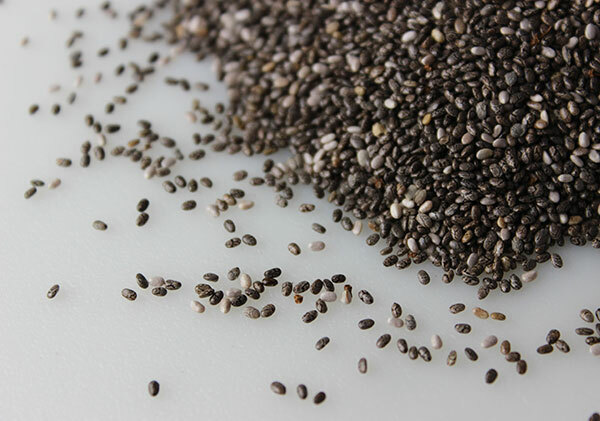 Chia seeds are a good source of calcium, boron, thiamine, niacin. riboflavin, folate, magnesium, iron and zinc. Nutritional Info: One ounce (28g) of raw chia seeds contains 4.4g of protein and 8.6g of fat with 0.9g saturated fats, 0.6g monounsaturated fats and 6.5g polyunsaturated fats. They are considerably higher in omega-3's compared to omega-6's. One ounce of chia seeds contains 137 calories. 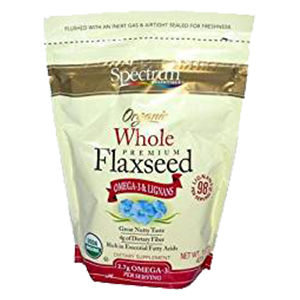 There are two types of flaxseed, brown flax and golden flax. Both hold similar properties as highly fibrous foods that help to cleanse the colon and promote regular bowel movements, very similar to chia seed. Flax oils are extremely sensitive to heat and become rancid quickly. For this reason, it is best to use freshly ground flax or soaked whole seeds with other foods or in recipes. Flax are high in lignans, a source of phytoestrogens, which may or may not be beneficial for some people. 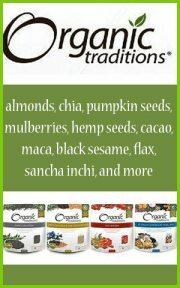 Chia seeds are a better alternative over flax if you are wanting to reduce dietary estrogen precursors. Flax seeds are known for their very high ratio of omega-3 fatty acids, essential nutrients for proper neurological functioning and cardiovascular health. 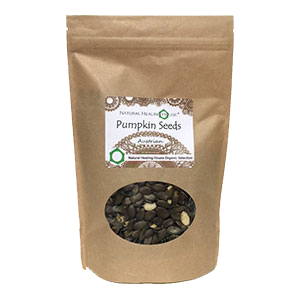 The seeds are a good source of manganese, selenium, copper and phosphorus and are particularly high in thiamine and magnesium. Nutritional Info: One ounce (28g) of raw flax seeds contains 5.1g of protein and 11.8g of fat with 1g saturated fats, 2.1g monounsaturated fats and 8g polyunsaturated fats. They are considerably higher in omega-3's compared to omega-6's with total omega-3 fatty acid content of 6388 mg vs.1655 mg of omega-6. One ounce of flax seeds contains 150 calories. 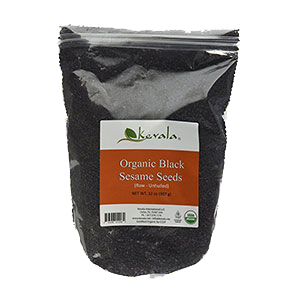 Whole raw sesame seeds come in both brown and black varieties and are native to parts of Africa although they have naturalized to many other parts of the world, especially tropical locations. Sesame is considered to be one of the oldest oilseed crops used since human existence. 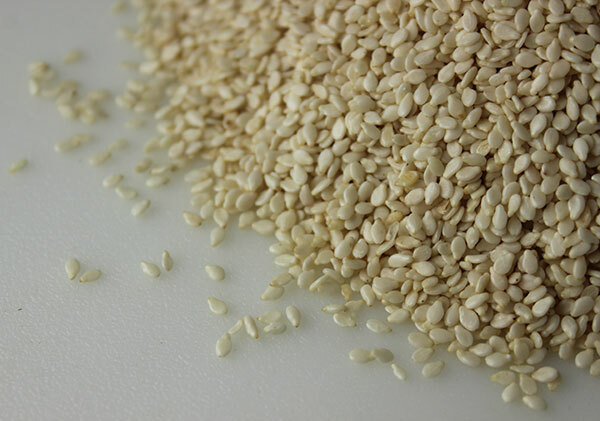 Sesame seeds contain the beneficial antioxidant phytosterols and lignan compounds, like sesamin, which has shown to be beneficial to health in some scientific research. In a study analyzing the antioxidative roles of sesamin, results indicated "that sesamin ingestion regulated the transcription levels of hepatic metabolizing enzymes for lipids and alcohol." 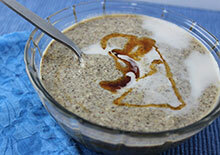 Sesame seeds are best if ground into tahini or soaked and blended with other foods for maximum nutritional absorption. 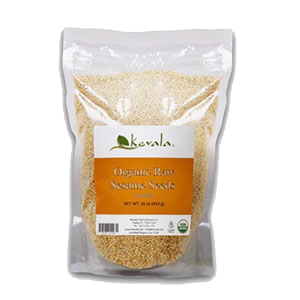 There are many wonderful uses for sesame in dressings, dips, desserts, like raw halva, as well as dehydrated Parmesan cheese. Nutritional Info: One ounce (28g) of sesame seeds contains 5g of protein and 13.9g of fat with 1.9g saturated fats, 5.3g monounsaturated fats and 6.1g polyunsaturated fats. They are considerably higher in omega-6's compared to omega-3's. 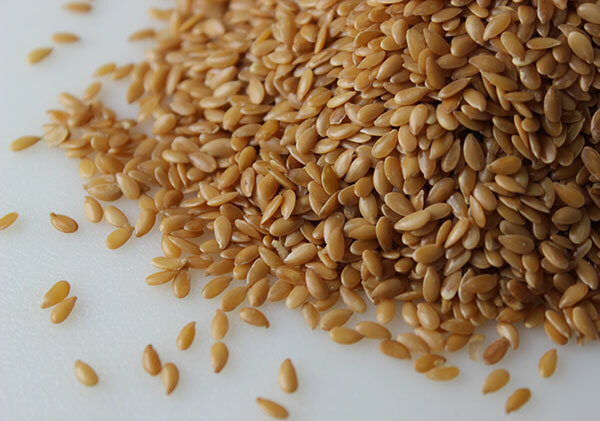 One ounce of sesame seeds contains 160 calories. Phytates, lectins and enzyme inhibitors are common antinutrients found in a number of nut and seed varieties in varying proportions. These substances can make it hard to completely digest and absorb the proteins, fats and nutrient content, which may contribute to various digestive issues when consumed in excess. Both seeds and most tree nuts contain a form of bound phosphorous called phytic acid which naturally serves to protect the seed until its germination process. However, when humans consume dietary phytic acid its "phytates" tend to bind to minerals such as iron, calcium, magnesium and zinc in the intestinal tract, in turn making them unavailable as a nutritional source. Phytic acid itself also acts as an enzyme inhibitor blocking some of the enzymes like pepsin and trypsin, needed for protein assimilation as well as amylase, which is required for converting starch into sugar. Enzyme inhibitors may also include various tannins and goitrogens that may be present in larger amounts in certain nuts and seeds. Lectin is a natural toxin especially found in hard bean types, but is also present in some nuts and seeds in fluctuating proportions. Known to cause gastrointestinal upset when consumed in high quantities, lectin content is significantly reduced by utilizing soaking and sprouting techniques. Phytates and other enzyme inhibitors can be eliminated or minimized by soaking the seed/nut in pure water for a number of hours. Usually this can be achieved by soaking overnight, or about 8 hours. Soft, fattier type nuts, like cashews, typically don't need to soak as long. After the soaking period, it is necessary to discard the soak liquid and rinse again with water. Some people also add in salt or lemon juice to the soak water to help neutralize enzyme inhibitors and reduce the phytic acid and lectin content. After soaking seeds and nuts, like almonds, pistachios, hazelnuts, sunflower and pumpkin seeds, you can dehydrate them to create a crunchy convenient snack food, much like their raw versions, which can be stored for long term use. Seeds like flax or chia, of course, don't require soaking and straining, but are usually just soaked to produce a gelatinous substance that can be further used in recipes and drinks. There are certain fattier type nuts without a thick skin layer that actually have a less nutrient inhibiting influence. This includes macadamia, hemp seeds, sesame, pine nut or brazil nut. Although they should not be consumed in excess, they are much tastier in their raw unsoaked state. 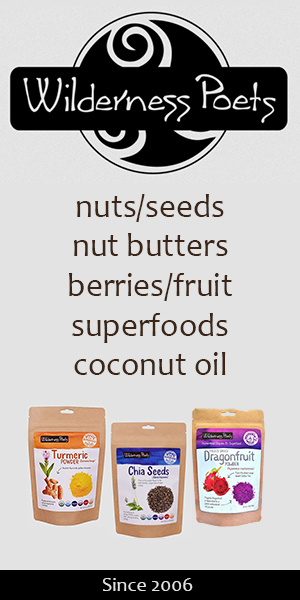 They can be further processed into nut butters to increase digestibility and used in occasional recipes and raw desserts. When consuming nuts without soaking them, it is beneficial to supplement intake with a quality digestive enzyme powder. An additional step to take after soaking your seed/nut is to sprout it slightly. 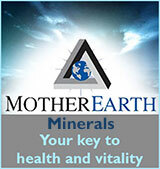 This process also significantly reduces toxic inhibitors that may effect complete absorption of the phytonutrients. 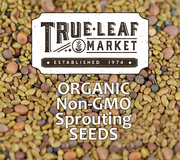 This involves the same process used to grow sprouts, like alfalfa sprouts, using a jar with a mesh lid and rinsing and draining daily until a white sprout begins to emerge from the nut or seed. Not all varieties will sprout, but good ones to experiment with might be almond, sunflower and pumpkin seed. For long term storage purposes we recommend you keep your nuts and seeds in the fridge or freezer to preserve their nutrient content and guard against rancidity. Unshelled nuts and seeds can be stored without refrigeration for long periods of time when kept in a cool, dry dark environment. Nuts and seeds should, of course, be avoided by those who have allergic reactions after consuming them. 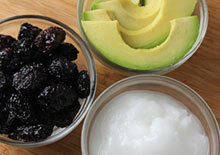 It is best to avoid most nuts and seeds when treating a yeast infection or candida overgrowth.